Chor, Extrachor und Chorgäste des Staatstheater Nürnberg, Staatsphilharmonie Nürnberg / Marcus Bosch. Staatstheater Nürnberg, Nürnberg, Germany. Sunday, October 15th, 2017. 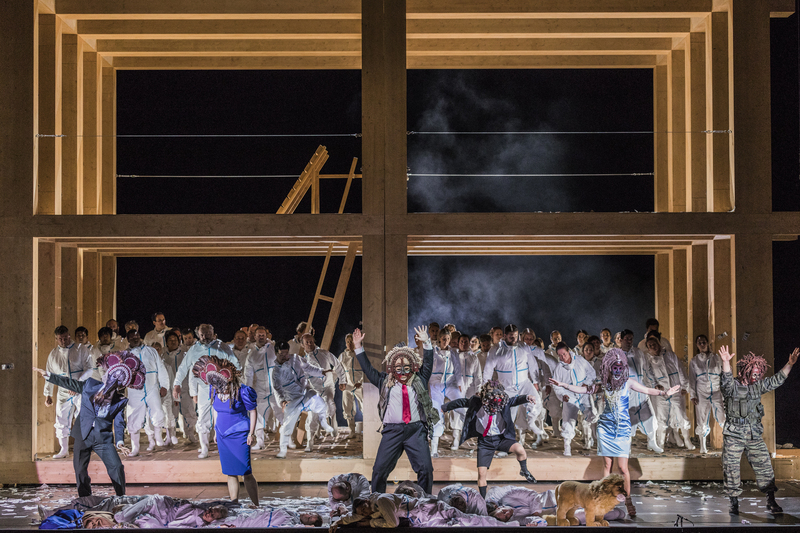 I have been waiting for years to see Calixto Bieito direct a staging of Les Troyens. However, once the running time for this Nürnberg performance was announced, I was disappointed to see that it would also be cut. Any disappointment I might have felt was surprisingly short lived as, by and large, the theatrical argument was so cogent that it defied the cuts. There was one cut that grated – the Act 4 septet was gone, surely one of the most ravishing things Berlioz ever wrote, heady with the Mediterranean night. 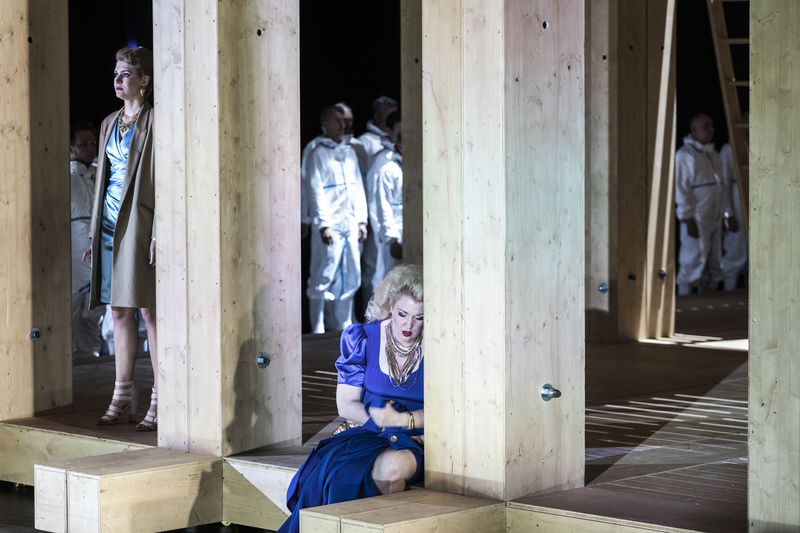 Otherwise, we lost the very opening of Act 3 with the act starting with the anthem ‘gloire à Didon’, the Anna/Narbal duet and Act 5 opened immediately with ‘inutiles regrets’, following a reading of Michel Houellebecq’s poem Isolement. Sadly, there was no mention in the program book of the rationale behind the cuts. What we did get, however, was bold and thrilling music theatre. As always, so much of what Bieito did was based in the text, playing on the homophones ‘dessin’ (drawing) and ‘dessein’ (design, plan). So, as Cassandre asks ‘quel dessein fatal’, we see a horse being painted at the back of the stage. The Trojans are a people living with PTSD. We don’t know the nature of the war they are coming out of, nor did we catch sight of the enemy. Yet the stage of siege was clear to all – there was a fear, almost irrational of what this ‘dess(e)in fatal’ represented. Was it the Greeks who were responsible or was it the Trojan leadership itself? Bieito deliberately left these questions unanswered, and in many ways, left hints that the implosion of Trojan society was due to its own paranoia and leadership. There was nothing heroic about this Énée – dressed as a tired accountant in a suit. There were suggestions that he was in thrall to the ghosts of shadowy forces, even more powerful than himself. We never really got to know what was real and what was imagined with the threat of the horse ultimately revealed to be empty. As always Bieito gives us something very much of the now – that irrational fear created by rumour with no foundation in fact. His vision is so powerful because we are made to feel afraid daily in newspapers or on sensationalist TV news channels. We are introduced to the Carthaginians in Hazmat suits – perhaps refugees who settled in the ruins of Troy. I found this image of creating a new civilization out of the polluted past as something quite powerful. Even here, this was a society that was easily led astray – this time by money and jewels. Particularly so when what they had to offer the Trojans was black gold – Italy being not so much a destination but a valuable commodity. We got a fascinating exploration of the development of a relationship between two people, Didon and Énée, as they realized that perhaps what matters is more than money, jewels or commodities. Bieito maps Didon’s journey most convincingly, the doubt and remorse that overtake her having allowed the Trojans to take root in Carthage was vividly portrayed. For Énée ‘la mort des héros’ isn’t found in heroic deeds, rather in him sacrificing himself through suicide, no longer able to sustain and perpetuate a system that is built on the exploitation and suffering of others. Even though he is gone, there are many more left to take his place – the final chorus intoned by an army of men in suits. In doing so, Bieito fully brings out that desolation and hopelessness contained in Didon’s final prophecy. 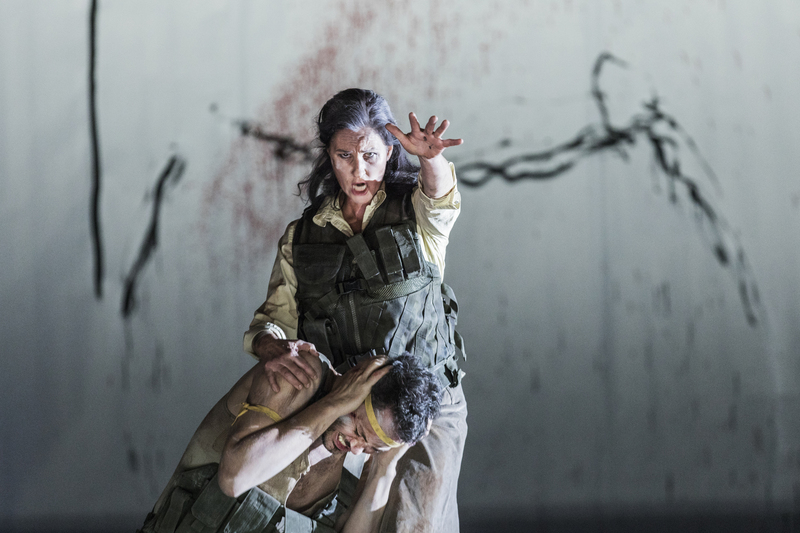 The sheer intelligence behind the staging, attention to detail, not to mention the complete conviction with which the vast forces executed Bieito’s vision, completely won me over. If this was a dramatically overwhelming performance, musically I’m afraid it didn’t quite have the same impact. 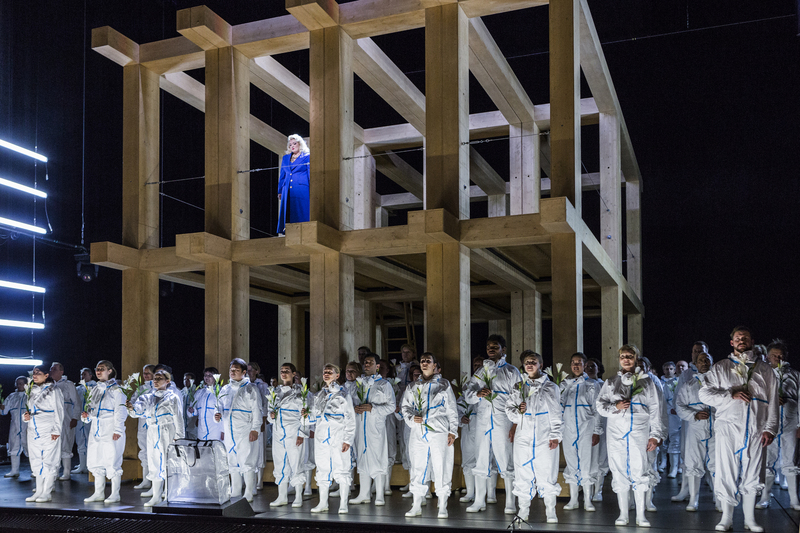 The text was certainly clear but often, Roswitha Christina Müller’s Cassandre excepted, it felt that many in the cast were singing over the text rather than with it. The house chorus, bolstered with the extra chorus and additional guests, gave us singing of staggering impact and power – the tenors especially impressing with their strength of tone and shining through the texture. The extreme dedication of the massed forces to everything asked of them was overwhelming – whether as a homogenous block or as a mass of individuals. The sound was huge, with blend and tuning absolutely spot on. They had clearly been exceptionally prepared by Tarmo Vaask. With the principals, there were a few signs of extra rehearsals being needed, with quite a few missed entries in places or words being occasionally being forgotten. Müller’s Cassandre was certainly a livewire, a prophetic seer desperate to be heard (her ‘baiser d’épouse’ was a bite to Chorèbe on his arm). 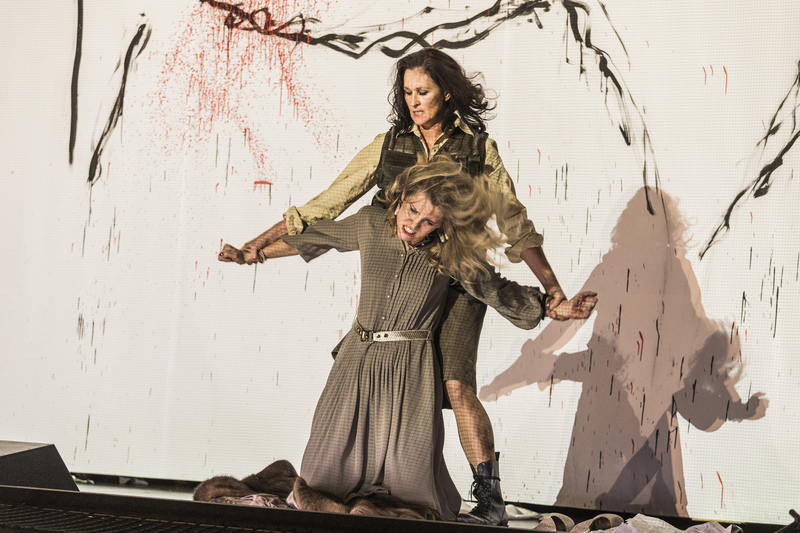 Vocally, the role lies somewhat high for her rich, full-bodied mezzo – the high B on ‘demain’ went astray and the tightness on top betrayed a sense that she was getting through the role on sheer willpower alone. Her Chorèbe, Jochen Kupfer, unfortunately had a tendency to hector his lines, missing that soothing comfort that ‘reviens à toi’ ideally needs. Costumed as a hybrid between Bonnie Tyler and Dolly Parton, all platinum backcombing, Katrin Adel sang Didon with an attractive, youthful soprano. Her fast vibrato gave the tone a sunny, citrusy edge. And yet, her singing felt generalized – everything she did, all the changes of mood, sounded identical. I longed for her to use the text to colour the line, although in the very final moments, she found a hieratic strength and metal that had previously been missing. She did sing her ‘adieu, fière cité’ with an attractive line and genuine dignity. Mirko Roschkowski’s Énée gave perhaps the most satisfying all-round performance. 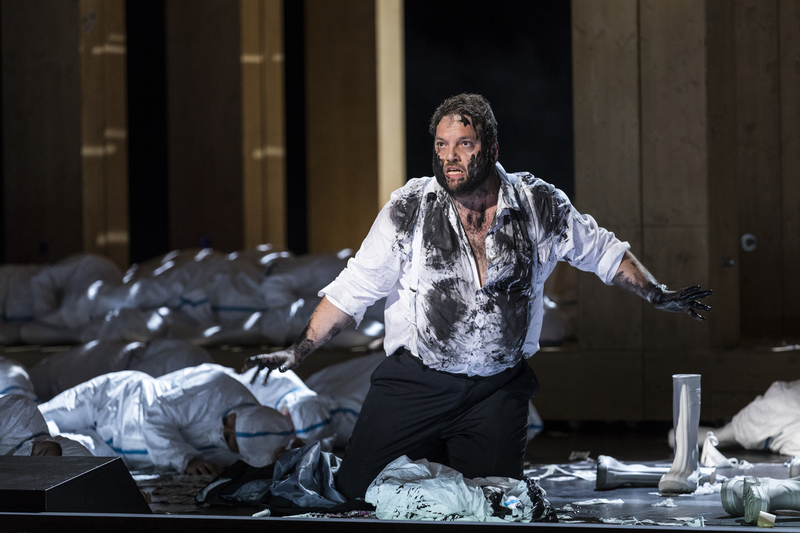 His is a bright, forward sound – more of a Mozart tenor than the ungainly, baritonal belters often cast in this role. Perhaps there was the lack of a heroic core to the tone but the sheer ease with which he stepped up to all of Berlioz’ demands on him, meant that one always felt secure in his vocalism – the laser-like beam of sound he produced at the top was impressive. The remainder of the cast was honourable. Anna’s music lies somewhat low for Irina Maltseva, lacking in resonance at the bottom, but she was an elegant and glamourous stage presence. A similar issue affected Nicolai Karnolsky’s Narbal. Again, the role sat slightly too low for him and the bottom sounded somewhat arid. Alex Kim’s Iopas gave an extrovert ‘blonde Cérès’, the tessitura posing no issues, but I do wish that he had varied the tone more and found more light and shade in the line. It was partly as a result of Marcus Bosch’s conducting. His tempo choices were curious – ‘blonde Cérès’ was rushed through, while the Cassandre/Chorèbe duet sagged. The band played decently enough – there was a classical poise to the strings that I found convincing and the brass were well behaved on the whole. This was the second performance of the run but there were still quite a few moments where the principals lost contact with the pit. This was unlike any Troyens I have seen before (and am likely to see again). 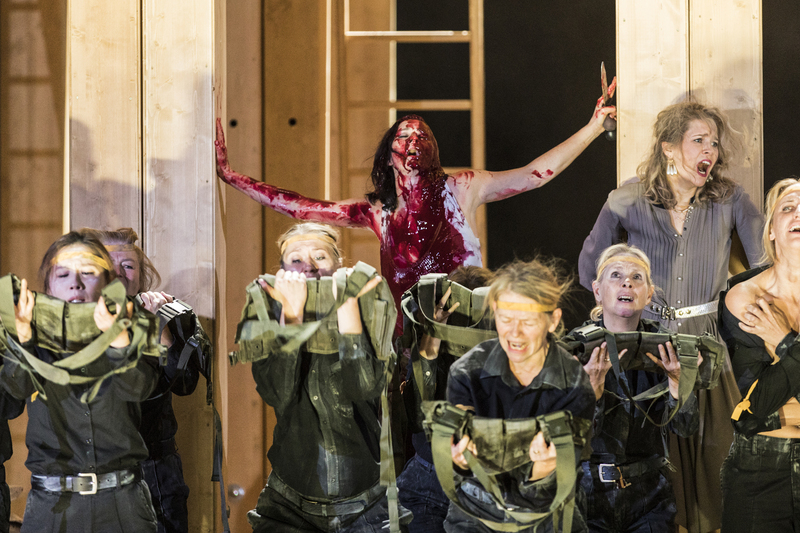 We didn’t get a complete Troyens but, with one exception, the cuts worked because the theatrical vision was so convincing, giving us an audacious reimagining of the work. This was a brave and radical piece of theatre, one that questioned the true nature of fear, of belief and of power. Musically it was respectable, if not quite fulfilling its potential, despite some strong performances and that glorious chorus. At first Bieito’s seems like a nihilistic vision – the exploitation of commodity-rich societies by the financially rich will always be there. And yet as always, behind this, Bieito gives us hope; hope that there is a way out, that we have to stop believing unquestionably, stop accepting what we are told we should fear, and that there is something bigger than materialism. Didon and Énée had to die because they allowed themselves to feel something for each other greater than money or oil. Heroism is found in the everyday, in the beauty and in the connection between two people. By allowing ourselves to feel and think differently, we can all become heroes. This was a gripping and inspiring evening in the theatre.